Comodo BackUp for Windows 10 - application to create and interact with backups. The program can perform archiving of logical partitions, folders and system files, includes a step-by-step wizard for generating images of a specific group of data. The utility is able to burn CDs, send backup copies to a remote server using TCP / IP or FTP protocols, supports work through a proxy server and can send notifications by e-mail. The application contains an incremental recording method, synchronizes data in real time, has a simple interface and a task scheduler. 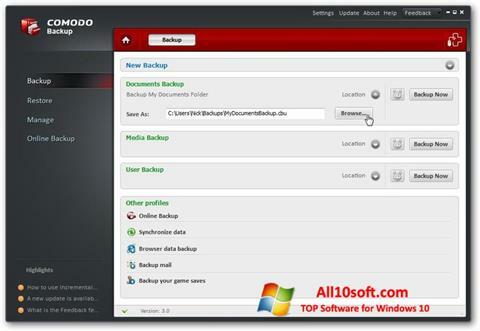 You can free download Comodo BackUp official latest version for Windows 10 in English.